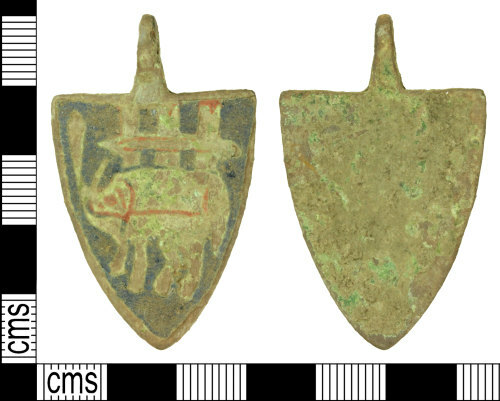 A medieval copper alloy enamelled and gilded harness pendant dating to the period c. AD 1300 - 1400. The harness pendant is shield-shaped with an offset perforated suspension loop extending perpendicularly from the top. The reverse of the pendant is undecorated and slightly concave. The obverse of the pendant exhibits a metal reserve running around the edge within which there is an enamelled design probably depicting an elephant with a castle on it's back picked out in red and green enamel with traces of gilding on a blue enamel background. The harness pendant measures 46.26mm in length (including suspension loop), 28.36mm maximum width, 1.78mm minimum width, is 2.58mm thick (not including suspension loop) and weighs 10.89g.